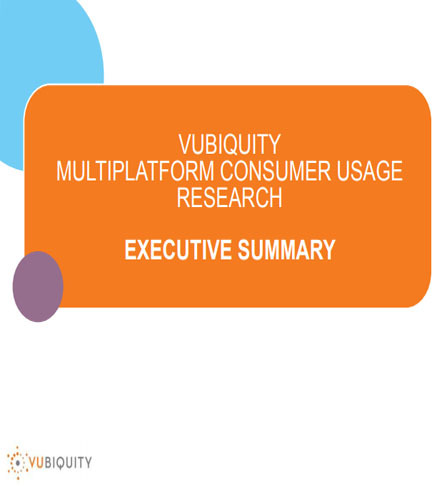 "Vubiquity Multiplatform Consumer Usage Research"
Vubiquity took an in-depth look into the video content consumption trends in today’s world. Consumers have a seemingly endless array of choices – from the kind of video consumption, to the screens on which to watch that video content. When asked if owners and users of smartphones and tablets were aware of TV Everywhere – 62% replied that they were aware of this service. Viewers increasingly expect the engagement online video offers, and the video technology is now sufficiently mature that cost-effective solutions exist for almost every use case. Whether you choose to go free, open-source, or with a commercial Online Video streaming Platform (OVP) provider, it’s almost certain there is a mix of products and services to suit your business. This whitepaper provides insights on things one should keep in mind, before commencing any video project. Key takeaways from this whitepaper on Video technology: The rise of video and its central role in multi-screen communication Overview of the main components and features of modern video platforms Managing SaaS VMS product lifecycles in the enterprise Sustaining a business with video as a core part of the multi-screen offering Many businesses have successfully addressed both mass and niche markets with entertaining and informative videos and monetized those videos effectively. Video conferencing or video conference is the use of technology, by users residing in different locations that receive and transmit audio-video signals enabling real-time communication. Video collaboration could include a point-to-point system or multi-point video conferencing. In businesses today, video conferencing is a core component that helps businesses function efficiently, dissolving borders.